So getting up the mountain to Kalimati is not as difficult as getting to Uri. Uri is a much longer drive to the jeep drop off and then a few hours trekking up past Ghandruk and then taking a right turn off the trekkers beaten track to Kot Danda. Pokhara to Uri is a days travel. Pokhara to Kalimati half a day without the need to walk. -Being able to get there all the way by jeep makes a big difference, although when you arrive there is still a fair amount of walking up steep rice terraces to get anywhere in the village which is very spread out. Jeeps go once a day in each direction – down the mountain 6:00am in the morning and then leaving midday to get back up by early evening. Getting to and from Kalimati school to where I sleep at night is just over an hours trek down up and down again or up down and up again depending on which direction. Tougher going back at the end of the day. 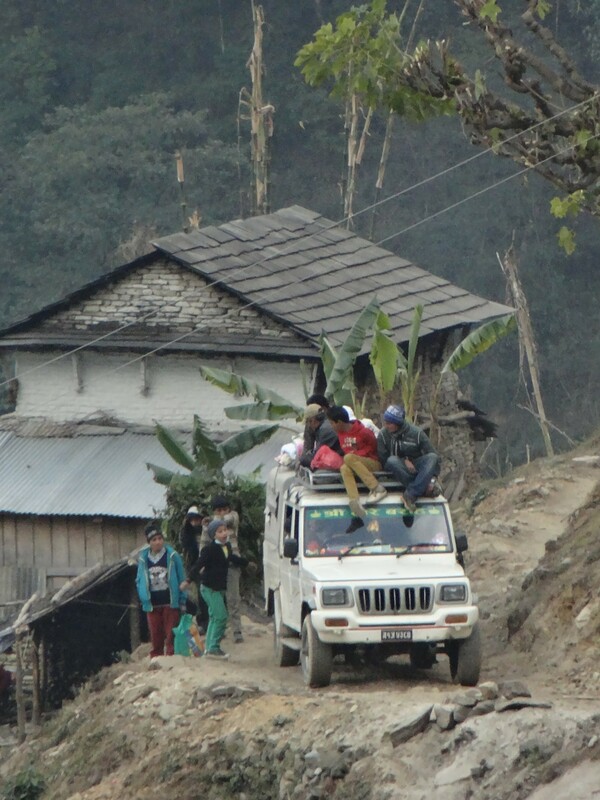 Sometimes I wait for the jeep coming back from Pokahra and catch a lift with them .. if there is space!!! Often there is not and its a case of people clinging on everywhere. The roads are pretty rough, barely a road really and very steep sides. Going up the mountain, if you have not managed to squeeze inside, it best to get a seat on the left hand side of the roof. I think the locals grown internally when they see me joining as with my big western backside, I take up the space of three Nepali ladies! So I often end up on the roof. Except last week the only option I had was hanging on the right hand side at the back – entirely the wrong side of the jeep. It means you get to see the terrifying cliff edge drop as the jeep trundles up miraculously not going over the edge. Except this time I thought it was curtains, I screamed and flung myself off the jeep landing flat on my back in the mud, much to everyone’s amusement and my embarrassment. Yesterday I was a walking day back home. It was late getting dark but the road is the middle of nowhere and quite safe. 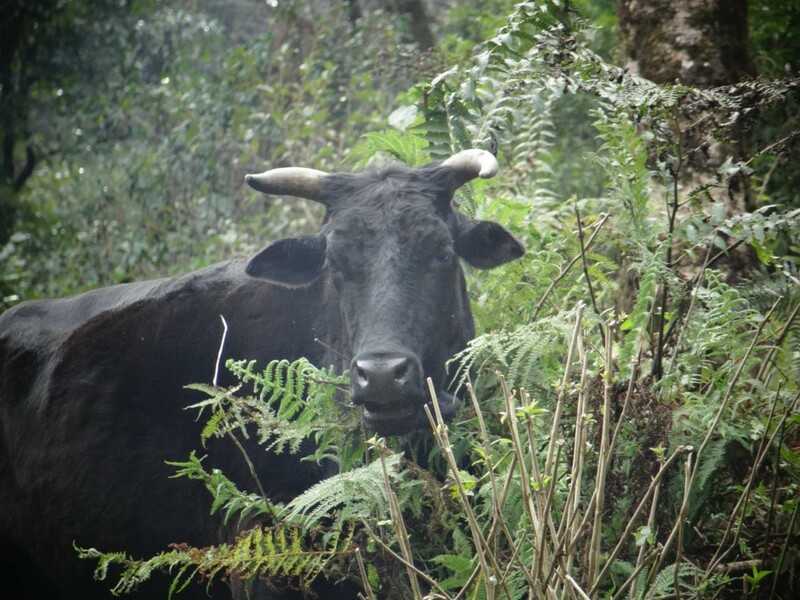 Now Nepal is full of buffalo. I had seen the children in Uri playing tag on the buffalo’s tails and they seemed docile enough. Walking home on the road ahead of me was one great big buffalo. What to do? I want to get back before it gets dark as I have no torch. Wait for it to move..? No it was docile enough .. I decide to just walk around and behind it. What I fail to notice is that this buffalo is not grey but black and not a docile buffalo at all, but a bull. Passing behind it I heard a great big bellow and snorting and before I knew it I am tossed in the air like a rag doll and next moment lying on the ground. The only thought in my mind is horns gouging and hoofs trampling and I screamed! I look up and it has trotted so quickly away it is only the pain in bum and the breathe knocked out of me I know I did not dream it. It all happened in a few seconds, from standing on the ground to being airbourne and then flat on my back. Never have i felt so physically vulnerable. My screams had echoed through the surrounding jungle and brought the attention of a couple of woodcutters. They took me into their makeshift tarpaulin tent where they were living, fed me something and poured hot black tea into me until the jeep arrived. Everyone was very concerned and ordered me never to walk again, the jeep was much safer. Reshem when he heard, said he knew the bull.. it had thrown him off the side of the mountain last year. My daily commute options… death by jeep or death by bull.